Après Furniture are specialists within the furniture industry and have extensive knowledge and expertise when it comes to open plan office design. Open Plan Office Desks are designed for high density business offices where the staff work closely in teams. In today's busy office environment, the need to communicate on a regular basis when working on projects is paramount. Open Plan Office Desks offer a positive departure from the potential isolation of cubicles, permanent desk dividers and even private offices. Our Open Plan Office Desks in the form of bench desks can also be configured into various sizes and with storage accessories. Our double bench desks offer flexibility, with a range of modules starting from a standard double bench, comprising of two desks back-to-back for two users. Many of our open plan office desks are modular, allowing the creation of larger linear bench systems for your open plan office layout. Your Open Plan Office Design does not have to be static or linear. Create different shapes to work with you interior space; there are also height-adjustable bench desks which could be integrated into your open plan space, accommodating each member of stafff with independent height adjustable surfaces, and ideal for hotdesking. Studies have proven that alternating between standing and sitting at work has a positive effect on health and subsequently improves work rate and morale. These are open plan office advantages with tangible benefits. Of course we at Après Furniture can help you choose your own open plan design, provide open plan suggestions and help you each step of the way. We can provide CAD drawings based on your measurements and support your requirements, quoting for a number of configurations if necessary to ensure that we provide you with the right solution for your open plan office furniture. Barbari Single Office Desks include management desking options with L-shaped tables. Barbari Modular Office Bench Desks for 1-6 users offers various working combinations. Borges Desk System has a central axis on which to add various modules. 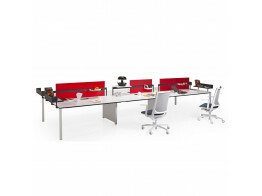 P50 Task Modular Office Desks provide the offic with single desks and beam bench desks. 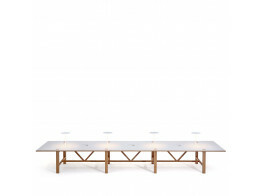 Bevel Office Tables by Norbert Geelen are available as a manager's desk, executive meeting tables and more. Primo height settable workstations can be set anywhere from 620mm to 850mm for taller users. Flexido is a modular office bench desk solution for teams of various sizes, as well as offering hotdesking solutions. Futuro Office Bench Desk System offers efficient office work surface space with third level storage.